We greatly appreciate the feedback from our Free Monitoring Tool users regarding the issue of Server Alerts not being delivered. We are currently working on it and it should be fixed shortly. This is just one of the features included in the Free Monitoring Tool and we encourage our customers to continue using the product. Please continue to let us know your feedback or any improvements you would like to see. Stay tuned to our blog and Forums for more updates. UPDATE 5/20/2009 @ 8:59pm: Server Alerts are now functioning again, we apologize to everyone for this interruption in service. We were working on upgrade the database and code and the most recent code roll out did cause a problem. We have resolved this problem at this time. UPDATE 5/22/2009: We are aware that the Free Monitoring Tool is issuing some false positive alerts at this time. We are working on correcting this as quickly as possible. UPDATE 5/22/2009: The false positive problem has been brought under control. There were two issues, both related to a software update. The first was that previously, we were only alerting if your email server failed to accept our TCP connection on port 25. Sending us a 400 SMTP error would not generate an alert. The code change caused servers that were either issuing 40x errors OR terminating our SMTP connections abruptly to be flagged as down. The numerous UP/down alerts were caused by servers that were running anti-spam software and intermittently refusing our SMTP sessions or issuing 400 deferrals. Remember, to reduce the chance of false positives from our monitoring service, you should whitelist 64.20.227.0/24 on your email servers or gateways that we are monitoring. We have restored the behavior of ONLY alerting you that your server is down if it fails to accept a TCP connection on port 25. Second, we have increased our timeouts, giving slow or busy servers more time to respond before flagging them as down. We appreciate your patience as we have worked to resolve this and sincerely regret any trouble this has caused you. This entry was posted in MX Alerts, MxWatch on May 20, 2009 by MxToolbox Blog. When reporting spam that slips past the filters, it is essential that we receive the full message headers from a message. Additionally, sometimes our Support department may request the full headers from an email message in order to troubleshoot mail delivery problems. Every single Internet e-mail message is made up of two parts the header and the message body of the email. Every single email you send or receive on the Internet contains an Internet Header, a full and valid e-mail header provides a detailed log of the network path taken by the message between the mail sender and the mail receiver(s) (email servers). Note: Please put a short but descriptive note in the subject or the body of the message so we can quickly assess your issue or problem. Note: If you need assistance in understanding email headers, please feel free to use our Email Header Analyzer. To begin, open the email message in a new window by double-clicking on it. On this new window menu, go to View -> Options. If you do not see options, you may have to reveal it by clicking on the two down arrows at the bottom of the menu. This will have brought up the Message Options window. The last component of this is the Internet Headers. Right-click inside the headers and choose Select All, then right-click again and choose Copy. Close the Message Options window. You should now be looking at the original message window. Click on forward and address the message to spam@mxtoolbox.com. In the area above the copied part of the message, Paste the Internet Headers and click Send. Double click on the email message so that it is opened in its own window. If you are new to Outlook 2007, you will be working on what is called the Ribbon. This is a series of tabs across the top of the message, Message, Developer etc. On the Message tab, in the Options section there is a little button with an arrow in it. Click on it and you have the message options menu with the internet headers in the bottom section. This will have brought up the Message Options window. The last component of this is the Internet Headers. Right-click inside the headers and choose Select All, then right-click again and choose Copy. Double click on the email message so that it is opened in its own window. This will bring up the Message Options window. The last component of this is the Internet Headers. From the File menu, click Properties. Right-click anywhere inside this window and choose Select All. Close this window, the details window and the message window (so you are back to the main Outlook Express program). If you already have the update or just installed it, open any message and look for Internet headers on the Options tab. If you don’t see the Options tab, choose View | Message Header to display it. Open the message you’d like to view headers for. Click Options from the drop-down menus. Near the bottom of the screen you’ll see a section titled Internet Headers. Close the Message Source box. Select Options, then Full Headers. Click Options from the drop-down menu. A box called Message Options pops up. Near the bottom of the box you’ll see a text area titled Internet headers. This will open a new window with the source headers, select all and send in a new message to spam@mxtoolbox.com. Choose View > Internet Headers. Click inside the new box that appears in your message and choose Edit > Select All. Copy the headers by right clicking, selecting all and then choosing copy. Choose View and then choose Source. A new window will appear containing the email with full headers. Press command + A, to select all, then command + C to copy. Click the down arrow next to Reply, at the top-right of the message pane. The full headers will appear in a new window, simply right-click inside the headers and choose Select All, then right-click again and choose Copy. Under Mail Viewing Preferences, go to Message Headers, then select ALL. Hit the small down arrow next to Forward and choose As Inline Text. Forward the message to spam@mxtoolbox.com. To begin, open the email message by clicking on it. Click on Details (right above the To: and From: fields) and choose View Message Source. Once in the Inbox, click on the message that you are getting the headers for. Right-click the message in the message list, and then click View source. Click on the tool bar icon labeled blah, blah, blah. This will expand the top of your email message and it will now include the full headers. Look for the first line that begins with “Received”. There should be a blank line just above it. Then, scroll down to the next blank line. The data in-between the two blank lines are the headers you need. You must configure Pine to allow showing message headers. You may skip steps 1-6 below if you have performed this configuration. Go to the Pine start up screen. Scroll down to the section labeled Advanced Command Preferences. Put an x for the enable-full-header-cmd feature. Type E to exit Config, and Y to save changes. The next time you read a message, type H and the full headers will be displayed at the top of the message. Type H again to hide the headers. Click on “Options” in the left-hand navigation bar. Change the Message Headers option to “Full”. Use the “Show Long Headers” option in the “Mail” menu while you have the message open. Click the “Show Original Headers…” button to bring up the full header info. When viewing the message, click File, then Save Message As. A standard save window will appear. Save the message as a .txt file (document.txt). Open the file you created, select all (ctrl-A) and copy (ctrl-c). Under “Show Message Headers”, select the “full” option. Click the OK button to save the setting. Juno version 4+ can display MIME and HTML email, but does not provide a way of viewing the HTML Source for the message within Juno. This entry was posted in Email Headers, Knowledgebase on May 18, 2009 by MxToolbox Blog. Spammers are the most resilient group of people that we at MxToolBox have ever seen! Spam volumes temporarily dropped in November 2008 when the McColo web hosting service was taken offline but since that drop in spam volumes, spam has been increasing an average of 1.2% per day in the first quarter. 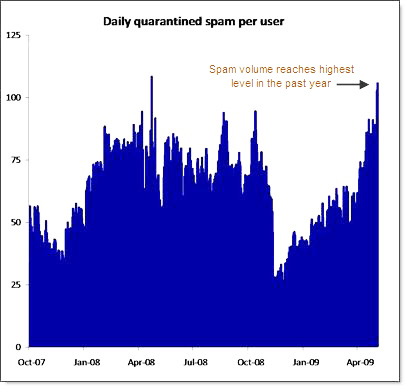 By comparison, the growth rate of spam volume in Q1 2008 was approximately 1% per day – which, at the time, was a record high. An alarming trend is that we have seen the return of image spam which was very prevalent in 2007. Typically spammers do not repeat spam campaigns, but perhaps they believe we have become forgetful? Our filters were oriented to block image spam back in 2007 and so we are confident that they will stand up to this latest trend. We’ve worked hard to make sure our Managed Email Services are providing the highest possible level of protection for our customers mailbox’s though any new spam tactics. MxToolBox is on Twitter! Make sure to follow us so that you stay up to date on any changes to our system, new blogs, new information etc. This entry was posted in MxWatch on May 15, 2009 by MxToolbox Blog. Server Monitoring takes the guessing out of server management. If something is wrong with your email server, you need to know right away. MX Toolbox’s Free Email Server Monitoring lets you rest easy by sending you alerts when there is a problem with server performance, availability or reputation. Some companies charge users for this service, at MxToolbox we are proud to give it to the email community. It doesn’t cost you a thing! Please note, to keep the service free, users are limited to monitoring one server. Additional servers can be easily added to your account for just $10/month each. If you are having issues with V1 Monitoring, please upgrade to V2 Monitoring by registering for a NEW account here. We will soon be migrating all existing V1 Monitoring accounts over to V2. This guide covers some of the more common questions/problems experienced with the Free Monitoring Tool. If you see any errors or have any feedback, please email us at support@mxtoolbox.com. These are the most common issues that users are having but we are working diligently to fix any bugs that are in the system. Thank you for your patience! NOTE: We have had reports that the Open Source Network Gateway Untangle does not work well with our servers. We are working with Untangle to resolve this, but we do not have a timeframe of when this will be resolved. If you have an Untangle setup, please feel free to email us at support@mxtoolbox.com so we can work with you on your setup. a) Monitoring Times or Polling Intervals are normally every 15 minutes for SMTP test, once in a 24 hour period for blacklist. Note: MX records are only updated once at the setup of the account. b) If you would like your Dashboard to be updated, we can run that update manually, please email us your domain name and IP to support@mxtoolbox.com. If you are finding that messages that you want to receive are not being received you may need an email continuity solution to assist with your delivery of mail. Please send an email to sales@mxtoolbox.com or for more information on our Email Business Products, go here. This entry was posted in MxWatch on May 7, 2009 by MxToolbox Blog. Having Trouble Controlling your Email Inbox? You Aren’t Alone! How many emails do you get a day? 10? 50? 200? These numbers are growing daily according to Fast Company Magazine, they estimate that “the average worker receives 200 a day.” If you are only using Microsoft Outlook this can mean that organization is difficult since Outlook treats all messages the same. This can cause problems because some emails, like notes from your boss are more important than newsletters or jokes of the day. 1) Zimbra Desktop (just released out of BETA and is Free) – Unlimited email storage is great but searching through thousands of emails is a hassle. The Conversation Views and Message Tags automatically highlight important emails in all your email accounts so you can find anything in a hurry. Advanced Search makes finding important pictures, documents or messages from people you care about a snap. Yahoo! Zimbra Desktop combines the best aspects of existing email clients (also known as POP or IMAP email clients) with modern web mail applications to make a totally new and improved experience. Nowhere else will you find an application with full email, contact, calendar, document management and offline access features for free! 2) ClearContext (Free for personal use, $90 per seat for project management) – offers the most immediate productivity gains. This is an Outlook add-on that understands who you’re replying to and how often and it automatically prioritizes the messages. It even color-codes the most pressing ones! and greys out mass emails. These are only a few small changes, but they make a big difference in prioritization and colors really brighten up your inbox! 3) ActiveWords ($30 per person annually) – This program helps you template our common email answers! This is an time-saver if you interact with customers and are commonly answering the same questions over and over. There are of course other tools out there, but these are the tools that we are using here at MxToolBox. We are always looking for new and improved ways to organize email and increase efficiency! This entry was posted in MxWatch on May 1, 2009 by MxToolbox Blog.